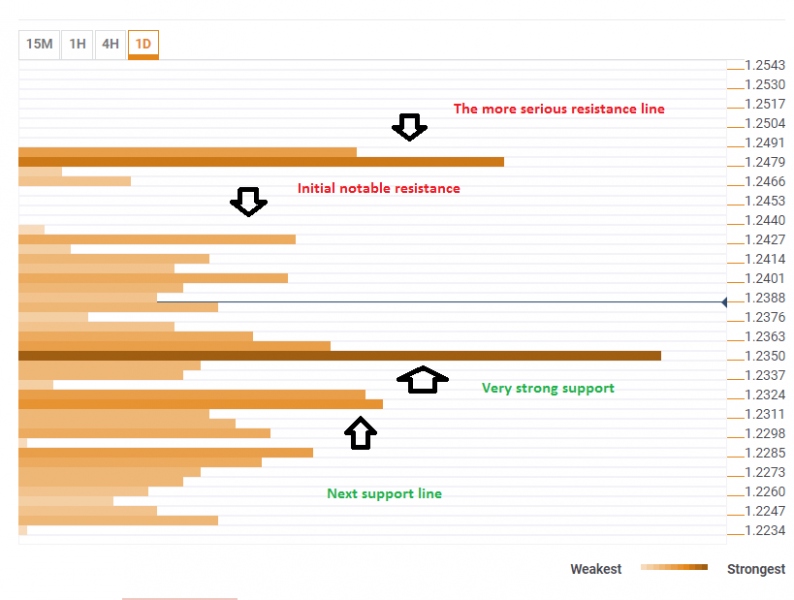 The EUR/USD is getting comfortable in a range, but it may not stay that way. When the pair chooses a direction, it may be to the upside. The Technical Confluences Indicator shows that the EUR/USD has lots of support on the downside and not so much resistance to the upside. There is a definite congestion of support at around $1.2350. This is the meeting point of the SMA200-15m, the SMA50-1h, the one-week high, Pivot Point one-week R1, Bolinger Band one-hour Lower (Stdv 2.2), the Fibo 38.2% one-day, the Fibo 38.2% one-month, and the SMA50 one-day. This clear confluence provides a lot of support. Looking up, the technical resistance lines are scattered with perhaps more resistance at $1.2425. This is a convergence of the PP one-day R2 and the Fibo 161.8% one-week. More serious resistance is only around $1.2480: the confluence of the PP one-week R2, the one-month high, and the Pivot Point one-month R1. Below $1.2350, we find further support around $1.2325, where the SMA200-4h, Bolinger Band one-day-Middle, PP one-day S1, and BB one hour Middle all meet.